The family of Islamist mass murderer Mohammad Merah says he will be buried in Algeria, but Algeirs has yet to agree. Islamist spree killer Mohammad Merah who killed seven people in southern France will be buried in Algeria. 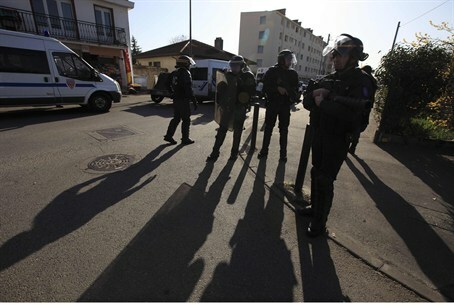 Merah, a 23-year-old Franco-Algerian who claimed ties to al-Qaeda, was killed by French police on 22 March after a lengthy stand-off at his Toulouse apartment. According to reports he was shot in the head by a police sniper as he leapt from a window amid a gunfight with onrushing police tactical officers who raided his hideout. It was the second gunfight in 32 hours between Merah and police. Three police officers were wounded in the exchange of fire that precipitated the stand-off. A close relative of Merah, who asked not to be named, told AFP his remains would arrive in Algiers today, via an Air Algeria flight. The body "will be accompanied by the mother and a sister of the deceased," the relative said, adding the corpse would first be prepared for burial according Muslim custom in France. Algerian authorities, however, have not yet agreed to Merah being buried in the north African country. President Nicolas Sarkozy branded Merah as a "fanatic and a monster" who killed three soldiers and four Jews in three attacks in and around Toulouse. Merah's father, Mohamed Benalel Merah, has threatened legal action against police over the death of his son, adding that he would not "shut up." The comment, reported in an Algerian Arab-language daily newspaper, appeared to be in response to French Foreign Minister Alain Juppe's angry reaction to the threatened lawsuit. "If I were the father of such a monster, I would shut my mouth in shame," Juppe said. Merah shot dead three French paratroopers in two separate attacks in Toulouse and nearby Montauban on March 11 and 15. Last Monday, he opened fire outside the Otzar HaTorah Jewish school in Toulouse, killing a 30-year-old teacher, his sons aged five and four, and a seven-year-old girl. On Sunday, authorities charged the gunman's brother, 29-year-old Abdelkader Merah, with complicity in the attacks. He has denied any involvement. A video of the killings was sent to the Al-Jazeera news channel, along with a letter in poorly written French claiming the attacks in the name of al-Qaeda. Al-Jazeera agreed not to broadcast the footage.